West Virginia has a little bit of a… connotation. To people who haven’t been there, that connotation generally starts with poor dental care and ends up with jokes about marrying cousins or couch burning. And some of that’s not inaccurate. The University of West Virginia does enjoy the occasional furniture fire to celebrate a Mountaineers victory. The towering Appalachian Mountains might house some people who enjoy living off the grid. And like anywhere, it has its share of people with unfortunate teeth. But there’s a reason they put “Almost Heaven” on the license plates. West of the Rockies you won’t find better mountain scenery in America, where those country roads John Denver sang about wind through majestic green mountains, over sweeping valleys, and past serene rivers. If you live in the northeast or the midwest, it’s the best weekend escape into mountainous nature that you’ll find without needing to get on a plane. And for a little taste of the rugged American West in the East, head to the tiny town of Fayetteville — one of the most underrated destinations in America. It’s the gateway to the best whitewater in the east. Fayetteville is about four hours from Pittsburgh, Washington, Charlotte, and Columbus and is best known as home to the thundering New River, the most treacherous stretch of whitewater east of the Rockies. While the slower sections make it one of the best tubing rivers in the country — where daylong parties with floating coolers of beer are a summer tradition — it’s the rapids that make it a destination. 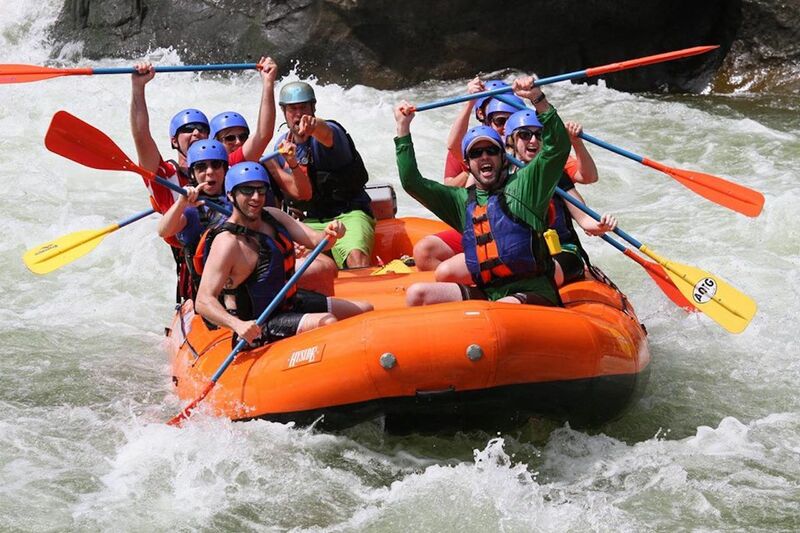 A half-day trip along the 6.5-mile stretch from Cunard to Fayetteville is nothing short of intense; it’s a 90-minute thrill ride where calm water lasts only a brief moment before your raft is flung back down into water holes with epic waves drenching the entire raft. Each rapid brings the new danger of a possible ejection into the furious New River, so a healthy combination of fear and laughter keeps the adrenaline pumping through your brain without letting up. The Class IV-V rapids with names like Dudley’s Dip, Harmon’s Hole, and Pinball hit you in rapid succession, leaving just enough time in between for guides to yell instructions over the powerful river. Adventures on the Gorge offers this trip for a pretty reasonable $100 or so. The trip ends right under the landmark New River Gorge Bridge, a 3,030-foot-long, 867-foot-tall bridge that was for a time the longest single-span arch bridge in the world. (It’s fourth now.) 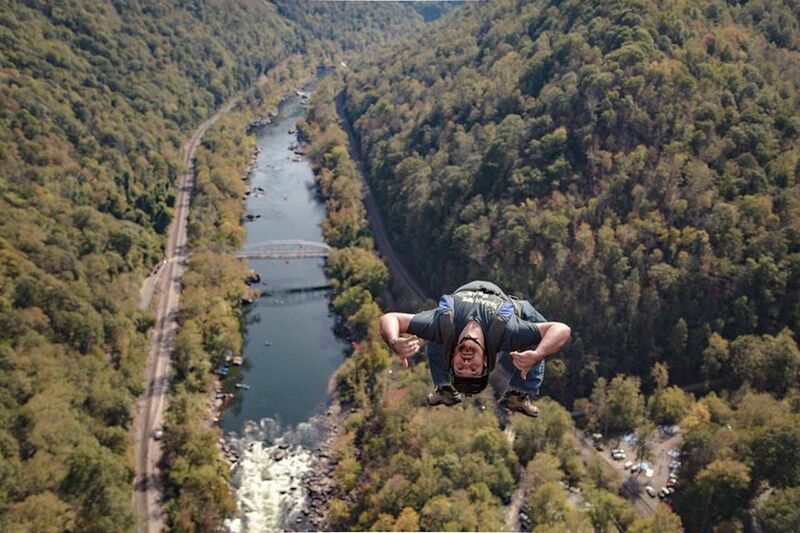 Every October, it hosts Bridge Day when bungee jumpers, base jumpers, and other people who enjoy plummeting to their almost-death hurl themselves off the bridge as tens of thousands of onlookers convene a daylong party on the banks of the New River. The river is without a doubt the main draw, but it’s by no means the extent of the nature there to be experienced. Hikes through the mountains surrounding the gorge provide cool walks through thick forests, leading out to spectacular views over the river. The most popular is the Bridge Trail, a 0.86-mile rocky road to the best overlook of the bridge. But longer trails like the 8.6-mile Kaymoor trail take you past old mines and through the mountains. After spending a morning on the river, a hike here reminds you that nature is still alive and well, that beautiful places still exist in the congested American East, and vacationing means getting out into it all. And it has food and drink scenes worthy of the nature around it. While the outdoors fill the days, Fayetteville’s diverse and creative food and drinks make the nights just as entertaining. The town could have easily become another casualty of the coal industry, but the former coal capital has shifted its focus to adventure and tourism. With that has come bars and restaurants that aren’t just good for a town of 3,000 people; they could hold their own in a big city. The newly opened Southside Junction Tap House is a beer bar with a local selection worthy of places you’d find in Colorado or California, and it’s often shoulder-to-shoulder packed with river guides sampling beers from the nearby Bridge Brew Works. The brewery is only a few miles from downtown and specializes in appropriately western beers like the Hellender Black and Goliath Double IPAs. Though the Black Diamond lager is the one you’ll find at bars throughout town. 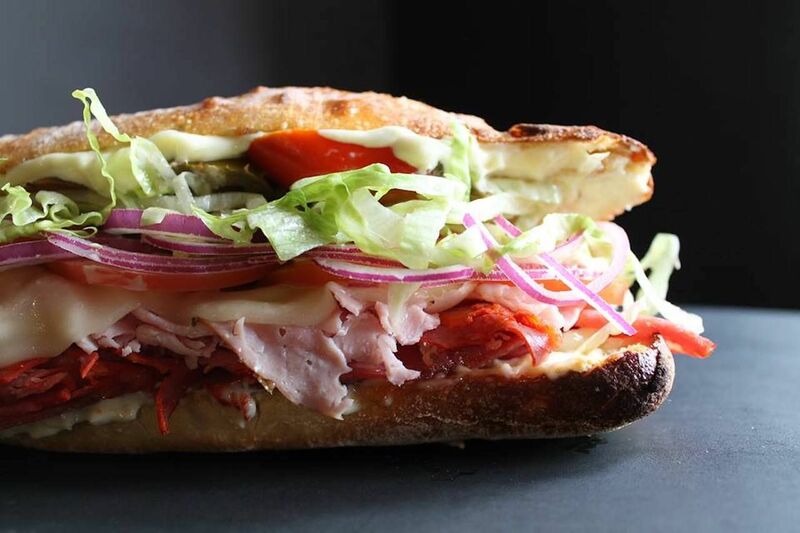 Past the historic early-20th-century buildings along Court Street in the downtown area, you’ll find the most acclaimed restaurant in town is the Secret Sandwich Society, where playful sandwiches named after presidents have garnered the national attention. Try the Ulysses with roasted pork loin, peach jam, swiss, and greens. Or, if you’re not a meat eater, the Fillmore with fried eggplant, cherry peppers, onions, and roasted-garlic mayo is a must-get. Up Maple Avenue from the city’s main intersection at Court Street you’ll find Pies and Pints, a classic pizza and beer joint slinging pies worthy of cities 1,000 times Fayetteville’s size. Much like at the Secret Sandwich Society, the menu here is innovative, featuring pizzas like sriracha shrimp, chipotle chicken, spicy Thai, and grape and gorgonzola, which highlight the specialty menu. They all pair with local draft beers, of which you’ll find half a dozen on tap and an expansive selection of bottles. For an after-dinner drink, stroll the calm streets to The Station, where off-duty guides sometimes man the bar, pouring craft cocktails you wouldn’t expect to find in the mountains of West Virginia. It’s also the city’s best upscale dining option with a seasonal menu featuring offerings like apple-smoked wings and arancini, as well as main plates like local trout and shrimp and sweet-corn grits. It’s a service station that has been converted into an elegant, well-lit restaurant that feels like a neighborhood spot you’d find in a larger city. Lodging options aren’t numerous, with much of the accommodation being chain motels like Quality Inn. But a real hidden gem is the Historic Morris Harvey House, located within walking distance of downtown restaurants and bars. 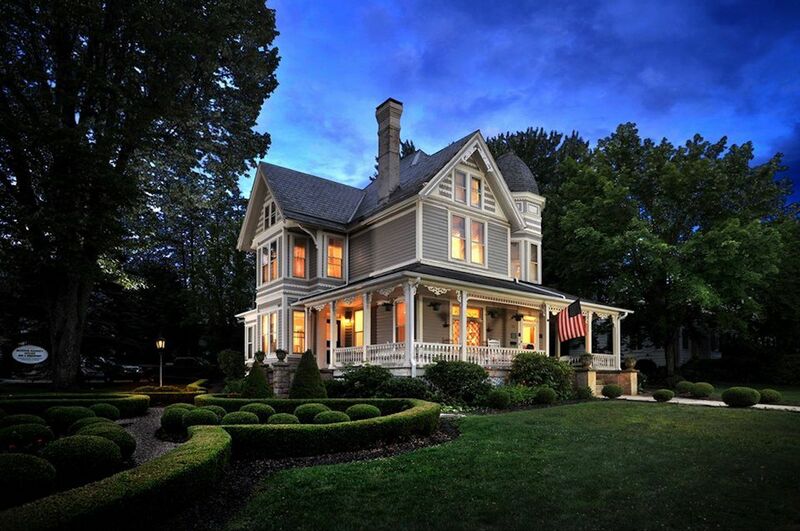 This old Gilded Age mansion is now a full-service bed and breakfast where rooms are adorned in antique furniture and breakfast is served on the front porch, with views of downtown and the mountains. If you’d prefer to stay in the woods, Adventures on the Gorge also rents no-frills lodging along with its whitewater expeditions. This ranges from rustic bunk-bed cabins to nicer, deluxe log cabins with legit mattresses. The facilities also include a ropes course, zip lines, and a swimming pool. And of course, there’s always the option to camp near the gorge at sites like Rifrafters Campground. Fayetteville doesn’t feel like the West Virginia you’ve come to imagine, but it’s actually the perfect embodiment of the underappreciated state: hospitable, adventure-filled, and relaxing. It’s perfectly suited for a weekend nature escape, where you can spend your days enjoying the mountains and whitewater and your nights exploring new flavors and sampling local beers. The friendly, open-minded locals will eschew your perception of rural Appalachia; the awe-inspiring scenery will leave you speechless; and by the end of your trip, the nickname “Almost Heaven” won’t seem far off from the truth.